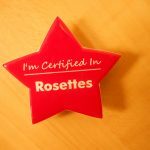 Are your employees just the best and you need new ways to recognize their certifications? Here at Coller Industries, our customer service department has the answer for all of your certifications needs! To better assist our customers in their ordering process, customer service is available to help process orders, answer product questions and overall be there for each person as needed. Meaning that each customer service representative needs to know how to use all of our products. A custom shaped name tag is a great way to draw attention to your company in a world of rectangle badges. Make sure your customers remember your company by selecting a shape to highlight your logo or that helps to define your company. We have 20 templates to choose from including ovals, a variety of animal shapes and more. With our advanced laser technology, we can create almost any shape or design. These star tags have become popular in our customer service department. 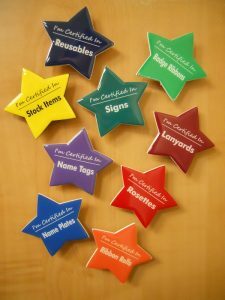 Due to the steps to becoming certified being so simple, almost all of our customer service team has every star. And that means one major thing for all of our customers. We know how to help you get what you want and need! So, don’t hesitate in getting any of your personal identification needs. Our customer service team is dedicated to helping you, our customer. Along with employees being knowledgeable we have them stick around for awhile. Which means you have a customer represenative that has a few years of experience which is a plus for the customers calling in and having the orders processed. Thank you, Charles, for pointing that out as well. We do have employees who like to stick around, and this definitely helps with knowledge retention so that we can better serve our customers.